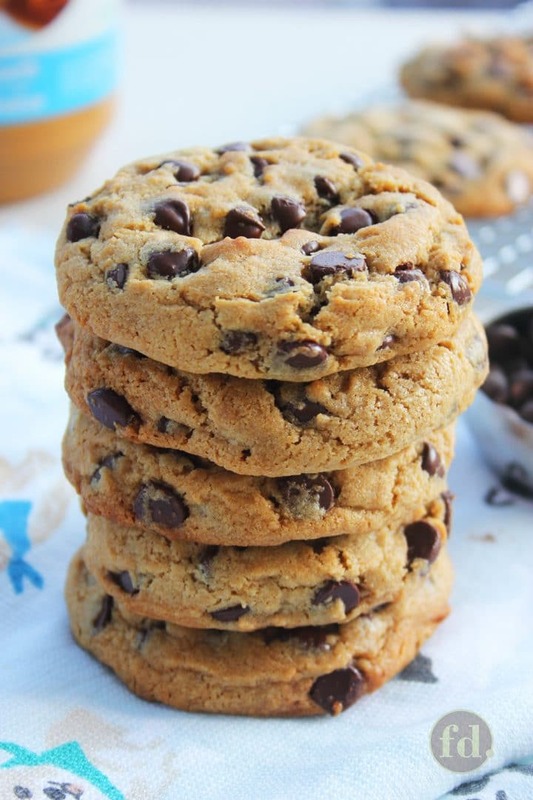 These AAH-MAZING peanut butter chocolate chip cookies are simply out of this world, crazy good! If you love your cookies thick and chunky, with a delicious chewy moistness in the centre, you have to get to baking these right away! An easy, quick and perfect treat for anyone who loves a sweet pick-me-up! Greetings from Canada, my dear readers! I’ve missed keeping in touch as things have gotten kind of crazy busy, but if nothing else, I’ve been surrounded by all the great cooks in my family over the last 6 weeks, and they’ve been pouring their hearts and love into all the yum I’ve been lapping up. And when I’ve not been indulging (read: literally gorging myself silly!) in food, food, food, I’ve been out in Canada’s beautiful wild outdoors, trekking and hiking. You’d probably never expect that my first recipe post after this quiet absence, would be on something as simple as cookies. It’s just that I had only begun to realise, over the course of this summer, how crazy my family was over cookies. I hate to admit it, but if anyone’s noticed, I am sorely lacking in cookie recipes on my blog. It’s not for a lack of love for cookies, believe me, because I am equally smitten as everyone else in my family. I first discovered real cookie love when I sunk my teeth into a CLASSIC CHOCOLATE CHUNK® cookie made by Cookies by George. George’s cookies are the ultimate standard that I’ve always aspired to recreate at home! It’s too bad we don’t have a Cookies by George in Singapore, that would be a dream come true for me! I’ve obviously got room to go towards creating my ultimate George’s cookie twin, but here’s a start, I hope, with what I can only describe as lip smacking, finger licking, super good, thick and chewy peanut butter chocolate chip cookies. So, I just have to ask, my dear readers, what are cookies to you? Oh, do tell… I’d love to hear your stories! For me, cookies are the snappiest treats I bake when I need something homemade that’s quick and easy to gift someone. Cookies are my pick-me-ups whenever I’m running on empty, and badly need a sugar whoosh to get me through the rest of my day. Cookies are the first things I pack on myself when I’m about to go on walks and hikes, and on long rides. Yup, cookies and me, we always go places together. We’re THIS (fingers crossed) tight. I think everyone should have their go-to recipe for their favourite cookie, don’t you agree? Even if you’re not a cookie lover, you just never know when you’ll need to pull out a good – no – make that a great, recipe at a moment’s notice. I’m so happy that I found an amazing one for these cookies by The Kitchen Magpie, I promise you won’t be disappointed! There are a couple of pointers you might find helpful before you get your bite into your slice of cookie heaven! Can I use chunky in place of smooth peanut butter? I say, use whatever you’d like! 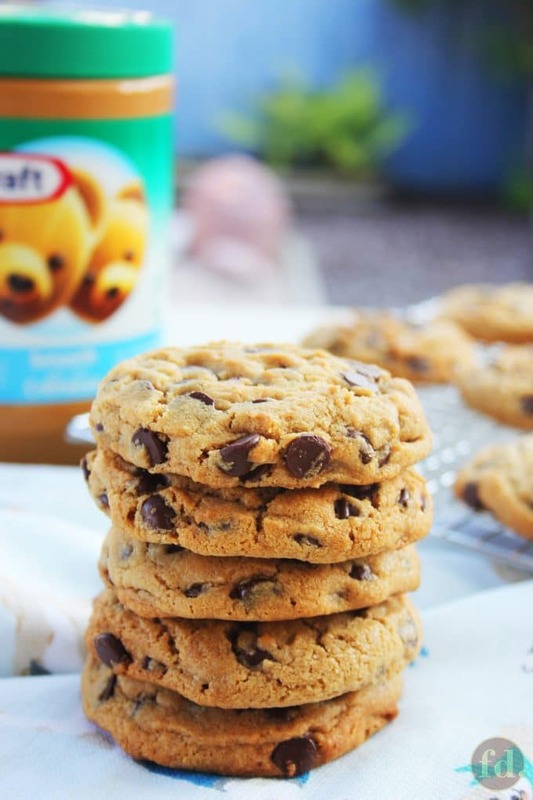 Just substitute chunky for smooth 1:1 ratio, as the amount of nuts in chunky peanut butter are not significant enough to dramatically change the outcome of these cookies. Should I use bitter-sweet or semi-sweet chocolate chips? Both would work equally well, though I personally prefer bitter-sweet to offset the sweetness of this cookie. This recipe uses 2 cups, which I know, may seem like an awful lot of chips but it’s what makes these cookies so fudgy and decadent! This recipe has had the amount of brown sugar reduced by 1/4 cup (that’s 25% less sugar than the amount in the original recipe), still the cookies turn out sweet but delightfully moist, and stays moist for up to 3 days after baking if stored in an air-tight container in a dry, cool place. You could reduce more, but you might not get as moist a cookie as you’d like. You’d really have to experiment and see what balance of sweetness and moistness works best for you. Can I replace light brown sugar with white sugar? Light brown sugar is what makes these cookies turn a lovely golden brown with a delightful moistness. White sugar will work fine when substituting brown sugar in equal quantity, but the cookies will be crispier, though that could be how you like your cookies? How can I tell when these cookies are baked just right? If you’re after crisp at the edges, and soft, chewy moistness in the centre, the key is to UNDER-BAKE your cookies! Under-baking doesn’t mean the cookies aren’t done, it just ensures that the cookies stay moist and chewy. 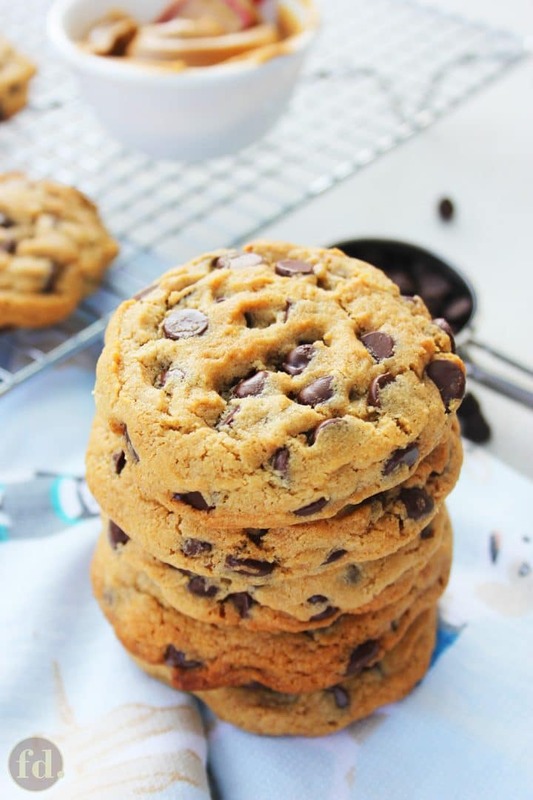 Once the cookies begin to just brown at the edges, and possibly with a few uneven brown spots on the tops, the cookies are baked long enough for a soft, chewy texture. I took 12 minutes with each batch I baked on the middle rack in the oven, but it may be more or less with your oven. The cookies will be very soft when out from the oven, so let cookies cool on the tray for at least 15 minutes to allow them to firm up enough for handling, otherwise they may easily crumble or fall apart. 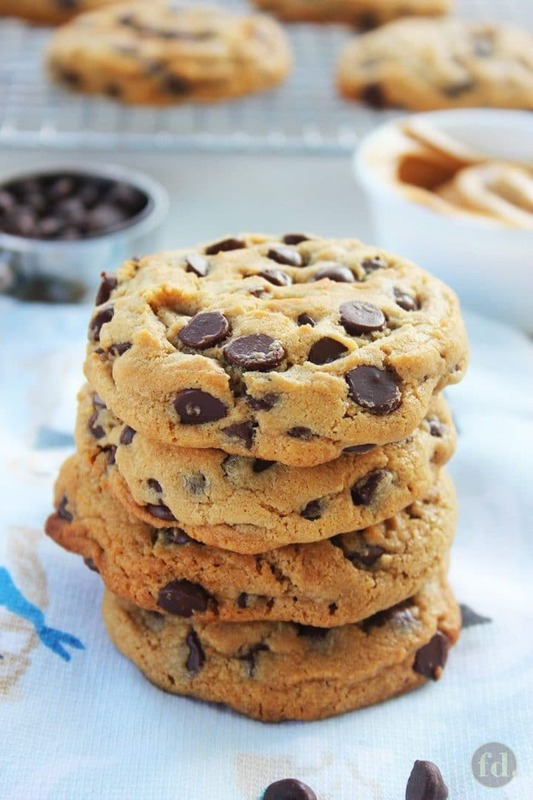 How can I get my cookies of uniform size, thickness and level on the tops? First of all, these cookies are made deliberately big! I just love mine this way! 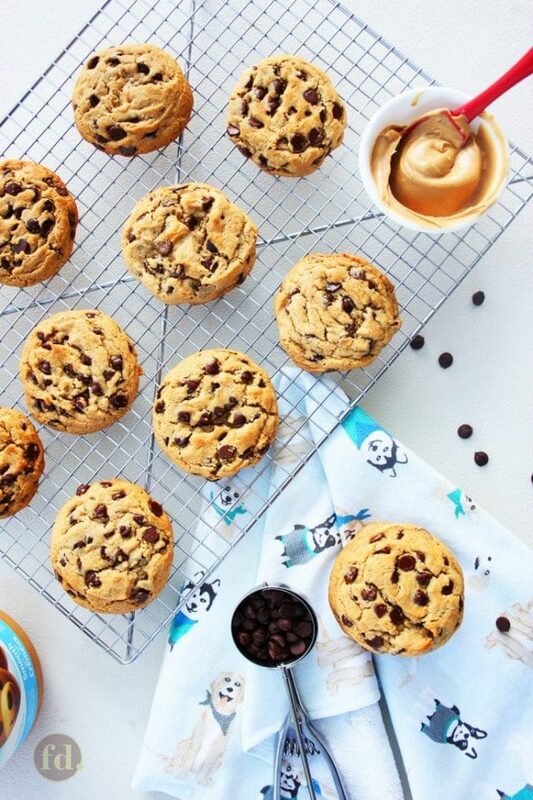 You could, of course, make cookies in any size you like. I recommend using an ice cream scoop (or cookie scoop) to scoop out the cookie dough onto the baking tray – this helps make cookies of more or less equal rounds. It’s also really important that you DO NOT FLATTEN BEFORE BAKING. Place the rounded balls of cookie dough on the baking tray, spacing each about 1 1/2 to 2 inches apart from each other. When the cookies are fresh out of the oven, they usually are slightly dome-shaped in the centre. Use a wide, flat spatula to lightly press on the cookie tops to level them so that the cookies are about 1/2 to 3/4-inch thick (or make thicker/thinner as you like). Allow the cookies to cool completely before storing. How can I avoid my cookies from spreading thin during baking? I can’t guarantee that your cookies won’t spread thin (they’ll still be awfully delicious, that much I can say!) once in a hot oven. I’ve been putting together this cookie dough in my brother’s kitchen in Canada where the temperature is a dry and cool 19°C, but I know that it’s going to be a totally different ball game when I get back to Singapore where it’s a humid and warm 27°C indoors! So, I highly recommend chilling your cookie dough once it all comes together, in the refrigerator for at least 30 minutes. One of our readers here highly recommended that you freeze the cookie dough for at least 2 hours, after you’ve shaped into balls, which helped reduce the spreading. If that still doesn’t quite resolve the spreading, then tweak the recipe, cutting back a bit on the butter or increasing the flour by 2 to 3 tbsps. Hope you all have fun with this one! I’d love to see all your bakes so remember to tag @foodelicacy or #foodelicacy when you post your pics! Pre-heat the oven to 190°C (375° F). Line a baking tray with baking or parchment paper. In an electric mixer (or with a hand-held mixer) fitted with a paddle attachment, cream the butter and sugar together on medium speed until well combined, about 2 to 3 minutes. Add the egg, and beat on low speed (mixture will curdle at first) until mixture comes together and is well combined. Add the peanut butter and vanilla extract. Beat for about one minute to combine well. Sift together the flour, baking soda and salt. Pour into the butter mixture, beat on low speed until flour mixture is fully incorporated and comes together as cookie dough. Add the chocolate chips and mix with a spatula/long spoon by hand until evenly distributed throughout the dough. Refrigerate the dough for at least 30 minutes. Using an ice-cream scoop, fill scoop with cookie dough and level with a spatula or flat blade. Release cookie dough from the scoop onto the prepared pan, spacing each about 1 1/2 to 2 inches apart. Bake for 12 minutes, or until the cookies turn golden brown around the edges, and with a few uneven brown spots on top. Remove from the oven. The cookies should still be slightly dome-shaped, are very soft and fragile. DO NOT REMOVE from the baking tray at this point. Using a flat spatula, press down lightly on each cookie until evenly flat and to your desired thickness, about 1/2 to 3/4 inch thick (or make thicker/thinner as desired). Leave the cookies to cool completely on the baking tray after flattening for 10 to 15 minutes, or until firm enough to handle. Transfer to a cooling rack. 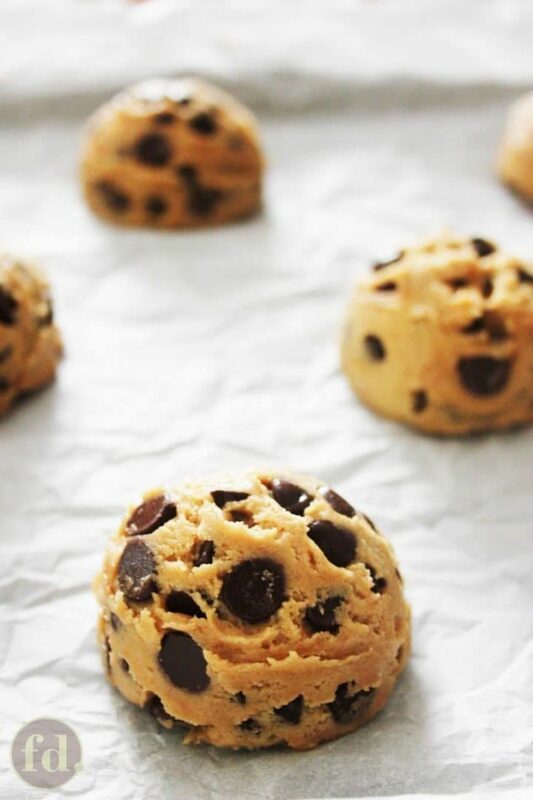 Make the next batch of cookies with remaining cookie dough until it is used up. Once completely cooled, store cookies in an air-tight container in a dry, cool place. These cookies will keep well for 3 to 5 days. Reader's Recommendation: After shaping cookie dough into balls, freeze for at least 2 hours to help reduce spreading. >> Bake for 12 minutes, or until the cookies turn golden brown around the edges, and with a few uneven brown spots on top. Remove from the oven. The cookies should still be slightly dome-shaped, are very soft and fragile. DO NOT REMOVE from the baking tray at this point. 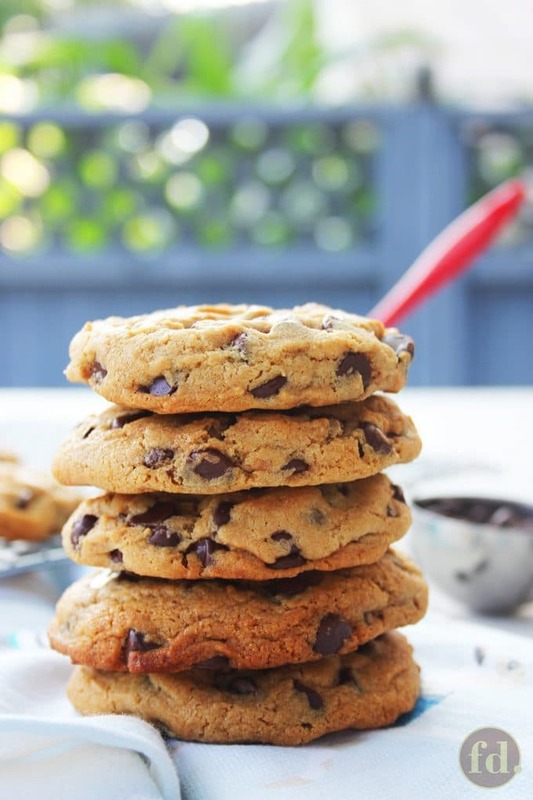 >>Using a flat spatula, press down lightly on each cookie until evenly flat and to your desired thickness, about 1/2 to 3/4 inch thick (or make thicker/thinner as desired). >>Leave the cookies to cool completely on the baking tray after flattening for 10 to 15 minutes, or until firm enough to handle. Transfer to a cooling rack. Hi Brittnee, the temperature setting is 190 deg C or 375 F. Hope it works out for you! I’m trying to make these cookies but the recipe isn’t loading… what temp are they supposed to bake and how long? These are super good. A bit drier thanI right they’re be but fresh out the oven, I am enjoying one with a bowl of vanilla ice cream! These are deeeeeeelicious. I made them according to the recipe, didn’t change a thing. I used Member’s mark brown sugar, gold medal ap flour; Kroger organic peanut butter(it was on sale); LoL salted butter (i just remembered it was salted? ); and mortons sea salt. I baked 2 pans at once, but the bottom didn’t cook as fast as the top. The top one browned a lot sooner. But they still came out good. These cookies are amazing! My little guys love them. They turned out so delicious! Hi Terri, I’m so thrilled these turned out great for you! Thank you so much for sharing and the 5-stars rating! These cookies are PERFECT! Followed recipe exactly. Mine took 13 minutes and I got 13 over sized cookies. The hints at the bottom are spot on! Wrapped them individually for a bake sale and they look like fancy store bought! Ha! Hi Denise, thank you so much for sharing!❤ I’m so glad you enjoyed these cookies, and love that you added walnuts into the mix, I’ll definitely have to try that myself the next time I make these! Have a great rest of the week! Wow! These are amazing. Very easy and they turned out lovely and delicious. I added walnuts because we love them, but other than that didn’t change a thing. Thanks for sharing this recipe with us, it’s great!!! Hello Andrea, good to hear from you! Thank you for writing in?. I’ve never had the pleasure of making natural peanut butter (I imagine it’d be so delish though!?) so I’m not sure how the consistency would work for or against these cookies. If it’s much softer than the regular jar variety of peanut butter at room temperature, it might be too soft for this recipe. I’m thinking the cookies would spread too thin during baking, and be thin cookie crisps rather than thick, chewy and soft in the centre. But you’re welcome to try, and I’d be really interested to know how it turns out! Thank you for the recipe. Quick question- Will natural peanut butter-the kind you have to stir and keep refrigerated, work for this recipe? Hi Sharon, thank you so much for writing in and I’m so thrilled you found me on this blog too! I must confess my blog is sorely lacking in cookie recipes, other than these must-try peanut butter chocolate chip cookies, and perhaps, closer to your heart, these chocolate chip and nut cookies. If you’re game to try, you could use the same recipe for the chocolate chip & nut cookies, but omit the nuts, and these cookies could be made crisp and crunchy by baking until nicely browned – it’ll crisp up after cooling to room temperature. I think Famous Amos ones are a little on the thick side, so I would chill the cookie dough for a good 30 minutes, before scooping onto the baking tray. Hope this helps! Sorry for not having a ready recipe for you to go with, but if this turns out the way you like it, please do share ya? Happy baking! Wow chanced upon your blog by searching for eggplant recipe and I can’t stop looking at all your recipes. Amazing list of recipes and thank you for this! 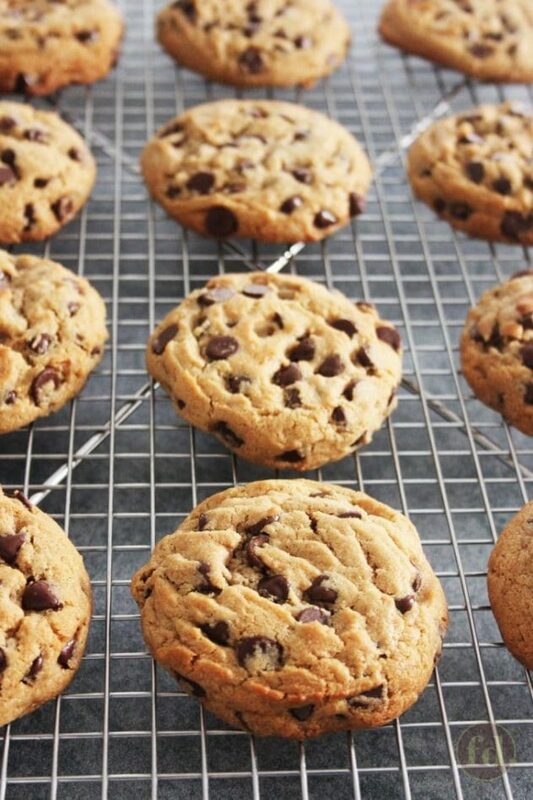 Do you have a recipe for crunchy choc chips cookies like Famous Amos? Hi Kamie, so thrilled to hear you and your family loved these! 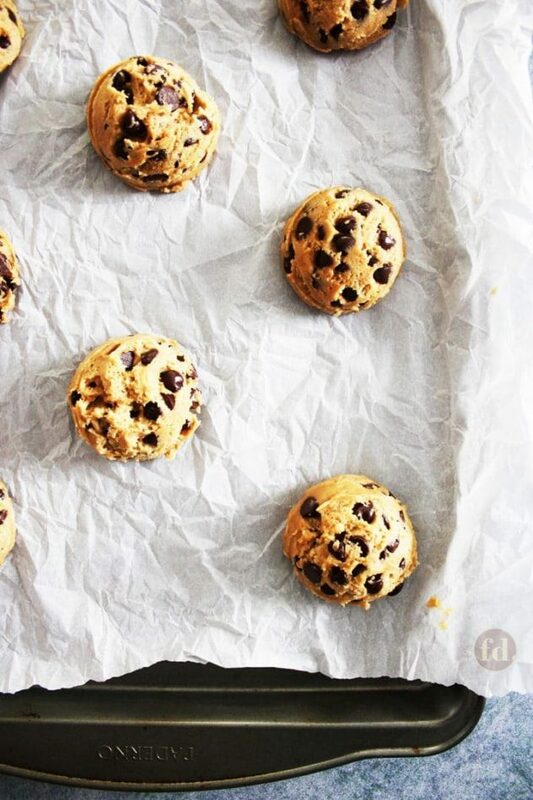 We can’t ever get enough of these cookies in our home too!? Thank you so much for writing in! Hands down the Best peanut butter cookie recipe I’ve ever tried! Thanks Celia! My family was in love with these? Hi Ellen, thanks so much for the tip! I’ll edit the post to share with all our readers! Have a lovely weekend!??? I would highly recommend freezing the dough for about 2 hours after you make the ball shapes, it really helps with them not spreading out as much!